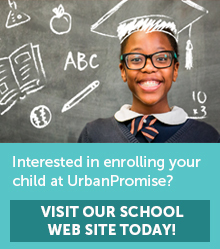 ...our mission at UrbanPromise has been to equip Camden's children and young adults with the skills necessary for academic achievement, life management, spiritual growth, and Christian leadership. We strive to fulfill this mission through after-school programs, summer camps, two schools, experiential learning, job training, and a host of other programs that challenge youth to develop and realize their potential. Through a myriad of neighborhood-based programs, UrbanPromise educated and empowered 815 Camden children and teens in 2017-2018. Our children and teens are encouraged to focus on their studies and achieve academically. 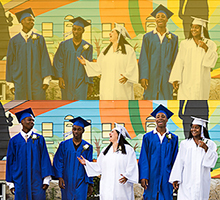 Of our high school grads, 95% are enrolled in higher education or a vocational training program. 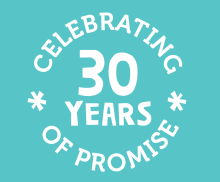 At least once a month, 253 individuals volunteer at UrbanPromise in a variety of capacities. We also host over 1,000 annual volunteers who participate in Saturday and week-long WorkGroup activities. Watch NowDiane Sawyer's Nightline UpdateWatch Diane Sawyer's update on UrbanPromise's students and alum, Karim, Ivan, and Josh, orginally featured on her 20/20 special "Waiting on the World to Change" in 2007. Starting at $35Pedal for PromisePedal for Promise is a 12 mile, 30 miles, or metric century bike ride. Each course begins and ends at Valenzano Family Winery, Shamong, NJ, and loops through Burlington County. Ticket(s) $90Taste of Promise: Food and Wine TastingThe evening will include a sampling of fare prepared by local chefs; wine and beer from around the region and the world; live and silent auctions featuring incredible sports and travel; live music; and a beer garden. campaignAmbassadors of Hope Scholarship FundThe Ambassadors of Hope Scholarship Fund has awarded over 100 scholarship to a total of 55 students ranging in amounts from $57 to $7,000. Learn more about our campaign. Destiny Wilson spent the other day drifting down the languid Cooper River away from Camden, toward the Delaware, in a canoe that she built with her own hands. Excitedly, she identified a double-crested cormorant, then a bald eagle and a few blue herons as they dozed in the shade or soared above. It’s difficult to imagine that, growing up in East Camden, Wilson, 18, once knew the Cooper River only in passing, her imagination stifled for years by Camden’s concrete confines. These days, she’s something of an expert on the water, but her aspirations don’t end at the Delaware. “I always wanted to go places when I was a kid, but I just never put in the work to get there,” she said. Today Wilson talks seriously about traveling beyond the city of her birth to such far-flung places as Greece and Switzerland. First, her sights are set on college. If all goes according to plan, she said, she’ll be her family’s first college graduate. She wants to study environmental science.